Tropical fish - are fish that live in either salt or freshwater but needs a warm (tropical) medium or temperature to live. Coldwater fish - these fish can be salt or fresh water fish which needs colder water temperatures. Marine fish - these are fish that live in salty seawater. Most commonly, marine fishes need tropical climate. Freshwater fish - these fish live in freshwater and are usually the fish that you would find in inland rivers and streams of most continents. They can be as colourful as marine fish and yet need less care. 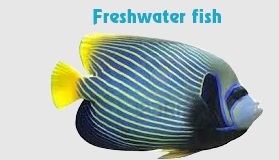 Most freshwater fish in the ornamental hobby are tropical fish, which require a heater. In short, the types can be Tropical Freshwater species, Tropical Marine species, Coldwater Fresh water species and Coldwater Marine species. Broadly the most common classification is Fresh water fish and Marine water fish. Some of the most common fresh water aquarium fishes are the gold fish, Koi (common carp), guppy, molly, swordtail, angelfish etc. Among the Marine aquarium fish species, damsel fish, clown fish (anemone fish) etc are best for beginners where as dragonets and lionfish should be kept only by experienced breeders with large tanks. Sharks, rays, batfishes etc should be avoided. Fresh water species are easier to keep than marine species. 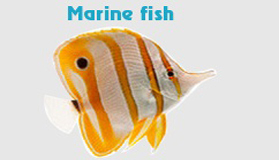 Many marine species will be completely incompatible and necessitate careful selection of species when choosing which fish to keep in ones aquarium.